The High Llamas have prepped what is one of their most lovely releases. That it is a sort of "concept album" should not scare you off as the "narrative" simply exists to hold these wisps of beauty together. Here Come The Rattling Trees, out Friday via Drag City, is the band's first album since 2011's Talahomi Way and, like the more conventional indie on that release, this album provides the sort of moments of beauty that many listeners of this band will embrace with open arms. After 2 understated and short introductory pieces, the title cut offers up a typically perfect Sean O'Hagan-fronted piece of work. 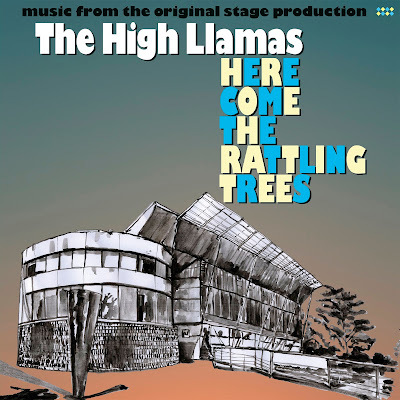 Sounding more organic than they have in the past -- though there are keyboards and bits of gentle electronica on Here Come The Rattling Trees -- the High Llamas here sound older and more reflective than they may have in the past. By the time we get to "Bramble Underscore" we're in familiar Llamas territory as the tune aches with that same sort of plaintive tune-age that fans of Gideon Gaye (1994) will well remember. "McKain James" offers up a jaunty keyboard-anchored cut of the kind that most followers of this group will welcome. It's spry and sad at the same time and that sort of mix is one that only this band can really deliver. Like other groups with such a unique and defined sound, The High Llamas are masters at crafting little moments that bridge the past (a Beach Boys-like sense of a good tune) and the future (the rough-and-retro futurism of their mates in Stereolab). That said, Here Come The Rattling Trees succeeds and broadens the Llamas' sound by virtue of its modesty. Penning a soundtrack has freed O'Hagan's imagination in some way and the music here is uniformly lovely and of the sort that one will find hard to categorize. I suppose that's a good thing as The High Llamas have, for more than 20 years now, existed outside of genre and convention. Their art is the sort that exists on its own terms and which remains quietly moving and affecting. Here Come The Rattling Trees fits in well in the band's catalog in that regard. Understated in the best way, this album charms with ease and a decided lack of pretension, especially amazing when one considers that this is indeed a "concept album" (of a sort). Here Come The Rattling Trees is out on Friday via Drag City. Follow The High Llamas via their official website.